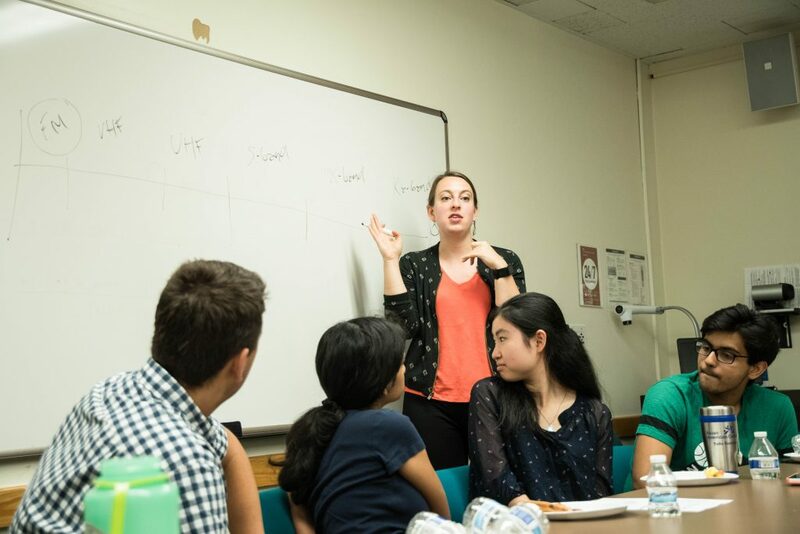 The International Relations (IR) Program went interplanetary on Wednesday as 12 students attended an East Hall lunch and learn about international space policies. The lunch and learn was led by Katherine Monson (F’ 13), a double Jumbo who majored in international relations and went on to complete a master’s in international relations and security studies from The Fletcher School of Law and Diplomacy. She currently serves as the director for business development at aerospace firm Kongsberg Satellite Services (KSAT), according to the event’s Facebook page. The event, sponsored by the IR Program, was designed to help students understand the value of an IR degree in the burgeoning space industry, according to Monson. Monson explained that before graduating from Tufts she hardly expected that IR would lead her to a career in aerospace. “I always thought that I would end up working for the Pentagon,” she said. To help the students in attendance better understand the many ways international relations interacts with space technology and business, Monson posed a hypothetical company that would use satellites to monitor melting arctic sea ice. Monitoring could have huge international business ramifications, she said, because as the ice melts, the opportunity to access arctic oil reserves and new shipping lanes arises. “If you go up and over [the Arctic], it’s way easier, faster and cheaper than sailing through the Suez Canal or around the Cape,” she said. The satellites, too, are inextricably tied to international law at nearly every stage of production. Monson described how corporations must acquire licenses to export equipment and technology across borders, to launch their satellite and even to utilize specific radio frequencies before they can book a launch date. Depending on the countries involved, meeting this regulatory process could take months. Monson explained that IR majors can play a role in the development of a satellite as well. Working in the private space sector is hardly an obvious career path for the get-out there-and-change-the-world-type IR major, Monson said, acknowledging a general belief that government is the only viable way to affect change as an IR major. But she defended the choice to work outside Washington. “I can have a lot more impact in the private sector than I can have in the government,” she said. During the presentation, Monson showed students satellite imagery of a burnt-out Burmese village that had been published by Human Rights Watch to expose the devastation of the country’s ongoing humanitarian crisis. She said that the images were taken by private American satellite firm DigitalGlobe. She also told the audience that their lack of an engineering background should not dissuade them from pursuing the highly specialized aerospace career. Crucially, Monson noted they should embrace the technical side of things. “Don’t let people Jedi mind trick you by saying that its ‘too technical to explain,'” she said. When asked by one student if a liberal arts education placed them at an employment disadvantage against engineering majors, Monson said it depends on your work ethic.